This is a browser based Web software hosted in the cloud with Data stored in Australia. Works on any device that can connect to the internet. Tall Emu CRM runs on Windows 2012 Terminal Server or Small Business Server. 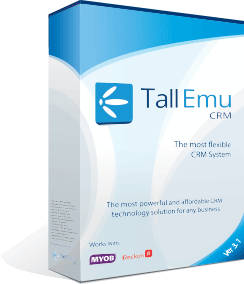 Tall Emu CRM has been known to run under parallels or virtual environments on Mac, but is not officially supported and not guaranteed. On Windows only, we support Outlook 2010 onward. Tall Emu CRM uses Microsoft SQL Server 2008 R2 and above; The express edition (Free) is supported but you will need to upgrade to the paid enterprise version for Databases over 10 GB. The size of the server will depend on your business. Smaller companies can use a peer to peer network running Windows XP (Service Pack 3 required) or above quite successfully. Any reasonably modern PC will suffice.